The Society Of Indian Automobile Manufactures have published their mobile application targeting various mobile platforms like Android , BlackBerry , Apple iOS and Windows for the event “Auto Expo’14“ which is scheduled to be held from February 7th – 11th, 2014 at India Expo Mart, Greater Noida. The app that mainly targets the digital visitor will help the visitors to reach to their favourite stall in the venue and lets the users to browse sitemaps, participants list, exhibits on display etc. 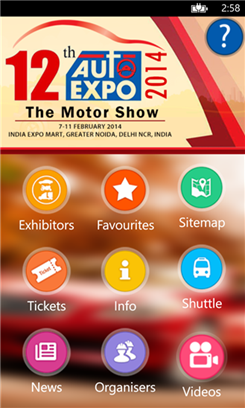 The Auto Expo’14 – The Motor Show 2014 App for Windows Phone 8 can be downloaded from Windows Phone store. Auto Expo – The Motor Show 2014 application Tutorial.